Matthias Hipp’s many inventions and adaptations include; Chronoscopes, Chronographs, Galvanometers, railway signalling equipment, watch and clock mechanisms, Telegraphic time detectors, telexes, networked electronic clocks, fire alarms, Microphones, Seismographs, electronic Gyroscopes and possibly the first ‘real’ electronic musical instrument. Hugh Davies. New Grove Dictionary of Music and Musicians. By simply changing the voltage supply to the metal tines via a keyboard, Hipp would have been able to create a scaled set of frequencies. Whatever technique Hipp used, the Electromechanical Piano seems to have been a one-off curio for Hipp, it doesn’t appear anywhere alongside the more commercial inventions in his illustrated catalogues of the period or in the inventory of the Neuchatel Telegraph factory. ‘The Controversy between G. E. Mller and Wilhelm Wundt over the proper measurement of reaction time’. Edward J. Haupt , Montclair State University 1999. Elisha Gray demonstrating the results of his ‘bathtub experiments’ using a variable electric current to vibrate a silver plate fixed to the instrument’s body. Elisha Gray would have been known to us as the inventor of the telephone if Alexander Graham bell hadn’t got to the patent office one hour before him. Instead, he goes down in history as the accidental creator of one of the first electronic musical instruments. Gray was inspired to investigate electro-acoustic effects after witnessing his nephew playing with his uncle’s equipment. The child had connected one end of a battery to himself and the other to a bathtub; by rubbing his hand on the bathtub’s surface he created an audible humming tone proportional to the electric current. Gray discovered that he could control sound from a self vibrating electromagnetic circuit and in doing so invented a basic single note oscillator. The original intention was to use this principle to develop an early version of muliplex telegraphic transmission; sending multiple telegraphic messages encoded as different pitches simultaneously over the same line which could be decoded at the receiving end. Using this principle he designed a musical instrument; The ‘Musical Telegraph’ or ‘Electro-Harmonic Telegraph’ initially to demonstrate and promote his ideas. Elisha Gray’s Musical Telegraph keyboard transmitter. My invention primarily consists in a novel art of producing musical impressions or sounds by means of a series of properly-tuned vibrating reeds or bars thrown into action by means of a series of keys opening or closing electric circuits. It also consists in a novel art of transmitting tunes so produced through an electric circuit and reproducing them at the receiving end of the line. Elisha Gray; Patent notes No. 173,618, Feb. 15, 1876.
washbasin receiver of 1847. 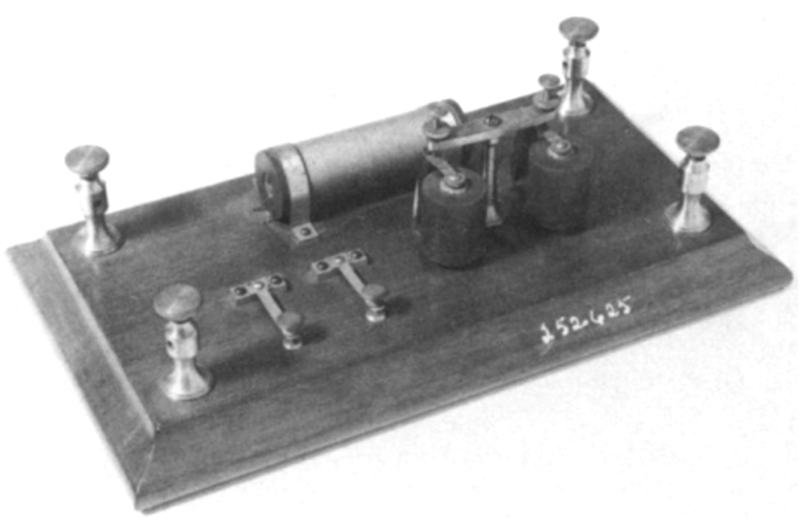 This device was designed to receive and amplify the signal remotely transmitted from the Musical Telegraph. With each key having an associated ‘oscillator’ the Musical Telegraph was truly polyphonic. To prevent sympathetic vibrations from non-active keys Gray used a series of mechanical stops allowing the production of a clean individual tone per key. Elisha Gray gave the first public demonstration of his invention for transmitting musical tones at the Presbyterian Church in Highland Park, Illinois on December 29, 1874 and transmitted “familiar melodies through telegraph wire” according to a newspaper announcement– possibly using a piano as a resonating amplifier. Elisha Gray’s first “Musical Telegraph” or “Harmonic Telegraph”used a simple two ‘oscillator’ keyboard design but later versions contained enough single-tone oscillators to play two octaves – Gray suggested that ‘Obviously the number of keys may be increased’ – and later models were equipped with a simple tone wheel control. Gray took the instrument on tour with him to the UK in 1874 transmitting musical tones over a distance of 200 miles or more. THE TELEPHONE EXHIBITION AT LINCOLN HALL. Airs Played In Philadelphia Distinctly Audible In Washington–Description of the Apparatus–Its Sound and What It Resembles–The Performance a Great Success. The atmospheric conditions last evening were far from favorable to the reception of music by telegraph, and it was not surprising, therefore, that the majority of those who went to Lincoln hall last evening to presence the latest triumph of American science–the telephone–were more or less doubtful of the success of the experiment they were about to witness. The interest manifested by our citizens in this grand and important invention could not have been attested in a more substantial manner, for the hall was filled to almost its amplest capacity by as intelligent and discriminating an audience as has gathered in that resort this season. The preparation for the exhibition of the telephone were quite simple and were easily observable. Several wires depended from the aperture over the chandelier in the centre of the room, and communicated some with a regular telegraphic instrument on the stage to the left of the audience, others with the receiving apparatus of the telephone. The latter was placed on the floor of the stage, to the right of the audience. It is a small apparatus, about six feet long and less than two feet high, and consists of sixteen square boxes, resembling in appearance and arrangement the tubes of a large organ. Miss Fannie Kellogg is a young lady of prepossessing appearance, but evidently still a novice in the concert-room. Her rendition of the Polonaise from “Mignon,” which is an extremely difficult passage, requiring the greatest flexibility and control of voice, was not even a mediocre performance, although she took the liberty of omitting the trills and substituting a few notes of her own for those of the composer, and to cap the climax the finale of the air was sang entirely out of key as well as out of time. Indeed, it was as complete a faux pas as we have ever witnessed at a first-class concert. Miss Kellogg, nevertheless, found many admirers, for she was loudly encored, and in response to repeated calls essayed that sweet and plaintive air of Apt’s–Embarrassment–which she sang but indifferently well. To Signor Tagliapietra we cannot award too much praise. He was in exquisite voice, and his singing was perfection itself. Mr. S. Liebling’s performance on the piano was artistic and finished. At the conclusion or the first part of the concert the piano was closed, and two young men raised the “receiving” apparatus of the telephone and placed it on the piano, after which a wire was adjusted to it, thus establishing direct communication with the “sending” instrument, in the office of the Western Union Telegraph Company in Philadelphia, presided over by Mr. F. Boscovitz. A telegraph operator next appeared and took up his position at the little table above referred to. Immediately afterwards a tall, spare gentleman with a beard came forward. This was Professor Gray, the inventor of the telephone. The Professor declared that he did not desire to exhibit the telephone as a great musical instrument, and if anybody expected to listen to grand music, he would inform them in advance that they would be disappointed. The Professor, although doubtless a genius in some respects, cannot be said to number oratory among his gifts. In a rambling, disconnected and ungrammatical speech, out or which it was impossible for the life of us to make head or tail, the Professor endeavored to explain in a scientific manner many things connected with the telephone. He was not permitted to continue the infliction very long, for the audience grew impatient, and manifested their feelings in a quiet way. The Professor was not slow to take the hint, and concluded his introductory remarks by requesting the greatest silence. He then directed the telegraph operator to inform Mr. Boscovitz at Philadelphia that everything was in readiness and he might begin. Within three or four seconds the first notes of “Home, Sweet Home” were distinctly audible in every part of the spacious ball, the melody being recognized perfectly. At the conclusion of the exhibition the judgment of all present was highly flattering to what may yet be numbered among the greatest inventions of modern times. Elisha Gray’s two octave keyboard transmitter now held at the Smithsonian Institute. ” practically useless . No person of taste or culture could be supposed to derive any enjoyment from music rendered in poor, harsh tones with uneven power and absolutely without expression or variation”. Grays ideas were further developed in 1885 by the German physicist Ernst Lorenz who added an experimental envelope control to Gray’s design. Alexander Graham Bell also designed an experimental ‘ Electric Harp’ for speech transmission over a telephone line using similar technology to Gray’s. Gray later founded the Western Electric Manufacturing Company In 1872 – parent firm of the present Western Electric Company – and two years later he retired to continue independent research and teaching at Oberlin College (Oberlin, Ohio, USA). Elisha Gray, the American inventor, who contested the invention of the telephone with Alexander Graham Bell. He was born in Barnesville, Ohio, on Aug. 2, 1835, and was brought up on a farm. He had to leave school early because of the death of his father, but later completed preparatory school and two years at Oberlin College while supporting himself as a carpenter. At college he became fascinated by electricity, and in 1867 he received a patent for an improved telegraph relay. During the rest of his life he was granted patents on about 70 other inventions, including the Telautograph (1888), an electrical device for reproducing writing at a distance.On Feb. 14, 1876, Gray filed with the U.S. Patent Office a caveat (an announcement of an invention he expected soon to patent) describing apparatus ‘for transmitting vocal sounds telegraphically.’ Unknown to Gray, Bell had only two hours earlier applied for an actual patent on an apparatus to accomplish the same end. It was later discovered, however, that the apparatus described in Gray’s caveat would have worked, while that in Bell’s patent would not have. After years of litigation, Bell was legally named the inventor of the telephone, although to many the question of who should be credited with the invention remained debatable. In 1872, Gray founded the Western Electric Manufacturing Company, parent firm of the present Western Electric Company. Two years later he retired to continue independent research and invention and to teach at Oberlin College. Gray died in Newtonville, Mass., on Jan. 21, 1901. ‘Electronic and Experimental Music: Technology, Music, and Culture’ By Thom Holmes. 1985, 2002 Thom Holmes; 2008 Taylor & Francis. P6. ‘Electronic and Experimental Music: Pioneers in Technology and Composition’ By Thomas B Holmes. Routledge 2002 P42. “When Music Was Broadcast by Telephone,” New York Times, May 11, 1975, D17. A Victorian carbon-arc ‘Moonlight’ lamp. Despite the invention of the incandescent electric light bulb ( Thomas Alva Edison and Joseph Swann, 1880) Carbon Arc Lamp were commonly used for street lighting and industrial applications – and remained so until the beginning of the twentieth century when developments in the lightbulb made the arc-lamp obsolete. The Carbon Arc Lamp generated light by creating a bright spark between two carbon nodes. The problem with this method of lighting, apart from the dullness of the light and inefficient use of electricity was a constant humming, shrieking or hissing noise emitted by the electric arc. The British physicist and electrical engineer William Duddell was appointed to solve the problem in London in 1899. During his experiments Duddell found that by varying the voltage supplied to the lamps he could create controllable audible frequencies from a resonant circuit caused by the rate of pulsation of exposed electrical arcs. Duddell,who may have been aware of Simon’s work, tried to solve the noise by adding a LC resonant circuit across the arc and in doing so he created a tuneable oscillator. By attaching a keyboard that varied the voltage input to the circuit Duddell created one of the first electronic musical instruments. Duddell’s invention the only ever electronic instrument to use an electrical arc to generate sound and the first electronic instrument that was audible without using the yet to be invented amplifier, loudspeaker or telephone system as an amplifier and speaker. When Duddell exhibited his invention to the London institution of Electrical Engineers it was noticed that arc lamps on the same circuit in other buildings also played music from Duddell’s machine this led to speculation that music delivered over the lighting network could be created. Duddell didn’t capitalise on his discovery and didn’t even file a patent for his instrument. 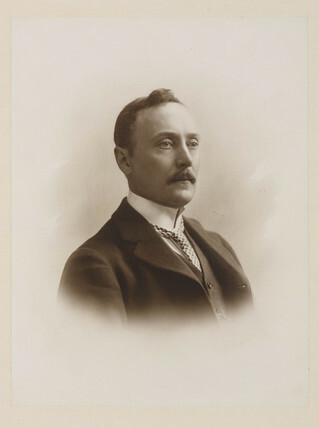 Duddell toured Britain with his invention in 1898 which unfortunately never became more than an amusing novelty; Duddell left the frequency within the audible range but later in 1902 Danish electrical engineers Valdemar Poulsen and Peder Pedersen realised that Duddell’s singing arc would function as a radio transmitter if the circuit was tuned to radio, rather than audio, frequencies. 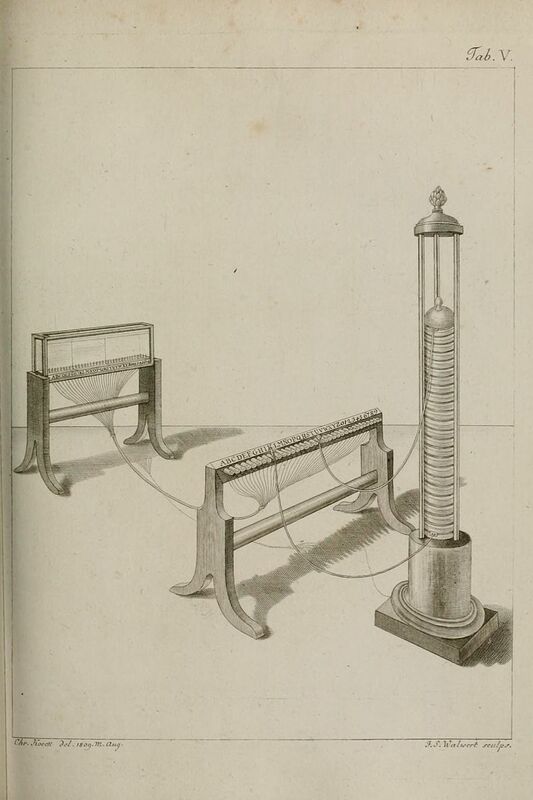 The carbon arc lamp’s audio capabilities was also used by Thadeus Cahill during his public demonstrations of his Telharmonium ten years later. Biographical Information: William du Bois Duddell. William Duddell an electrical engineer in Victorian England was famous for developing a number of electronic instruments notably the “moving coil oscillograph” an early oscillator type device for the photographic monitoring of audio frequency waveforms. 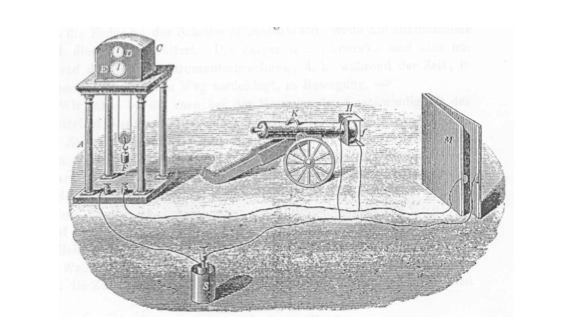 Other inventions of Duddell’s included the thermo-ammeter, thermo-galvanometer (an instrument for measuring minute currents and potential differences later used for measuring antenna currents and still used in modified form today)and a magnetic standard, which was used for the calibration of ballistic galvanometers. In 1895 Thaddeus Cahill submitted his first patent for the Telharmonium “The Art of and Apparatus for Generating and Distributing Music Electrically”. The Telharmonium can be considered the first significant electronic musical instrument and was a method of electro-magnetically synthesising and distributing music over the new telephone networks of victorian America. Thaddeus Cahill’s patent documents for the first Telharmonium of 1897 showing the arrangement of rotor alternators and rheostat brushes. This first patent was initially rejected by the patent office because the “plan contained principles and practices found in other patented devices”. Cahill, a trained lawyer, eventually succeeded in having his patent accepted in 1897. 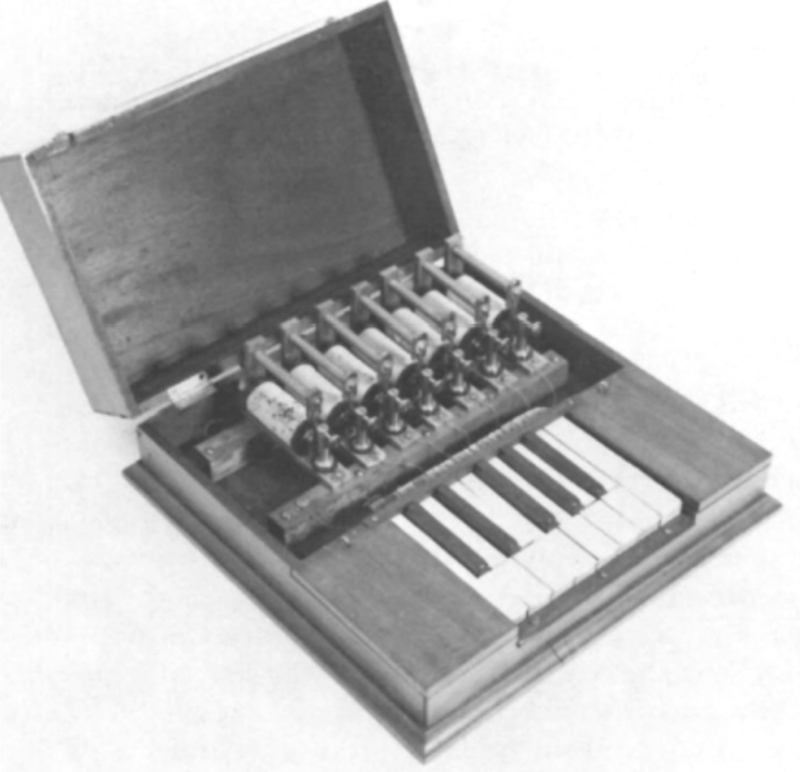 The first design of the instrument set out the principles of the ‘Telharmonium’ or ‘Dynamophone’ that would be developed by Cahill over the next twenty years. Cahill’s vision was to create a universal ’perfect instrument’; an instrument that could produce absolutely perfect tones, mechanically controlled with scientific certainty. The Telharmonium would allow the player to combine the sustain of a pipe organ with the expression of a piano, the musical intensity of a violin with polyphony of a string section and the timbre and power of wind instruments with the chord ability of an organ. Having corrected the ‘defects’ of these traditional instruments the superior Telharmonium would render them obsolete. The other innovative aspect of Cahill’s design was that he proposed to distribute the electronic musical output of the instrument over the newly established telephone network to subscribers at home or in hotels and public spaces; hence the name ‘Telharmonium’ – ‘Telegraphic Harmony’. This was partly due to the fact that the only way of hearing the instrument in the pre-amplifier and loudspeaker era was via an acoustically amplified telephone receiver. In 1885 Hermann Helmholtz’s ‘On the Sensations of Tone’ (1862) appeared in English translation and had an immediate and profound impact on scientific and musical thinking. Helmholtz defined the concept that a tone was composed of a single fundamental sound which, combined with a set of higher sounds, gave each musical tone a unique quality or timbre – and that these tones were a collection of ‘pure’ sine tone. Cahill’s reasoning was that the ‘perfect instrument’ could be built to created sine tones that could be combined to recreate the qualities of existing instruments without their ‘defects’. The idea of transmitting music over he telegraphic or Telephone network was not new. Cahill was well aware of previous inventions and experiments with Telegraphic music. 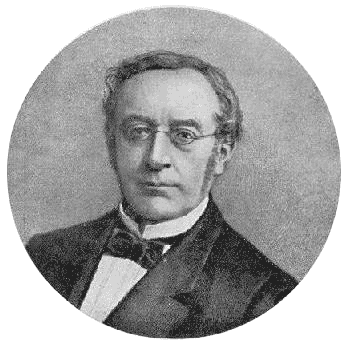 As far back as 1809,the Prussian anthropologist, paleontologist and inventor Samuel Thomas Soemmerring created an electrical telegraph that triggered an array of tuned bells from a distance of several kilometres. This experiment was originally as an intended as an investigation into human consciousness and perception but led to speculation about the possibilities of transmitting music electronically over great distances. 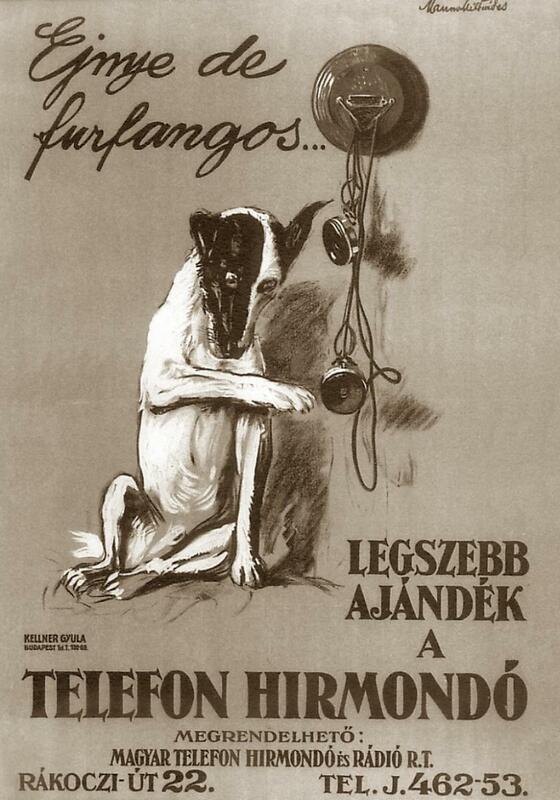 In 1893 the Hungarian engineer and inventor Tivadar Puskás established the ‘Telefonhírmondó’ or ‘Telephone Herald’ a type of telephone based newspaper that broadcast music and news over the telephone network in Budapest to as many as 91,000 subscribers which continued (in tandem with a radio service) until World War II when the wire network was destroyed. 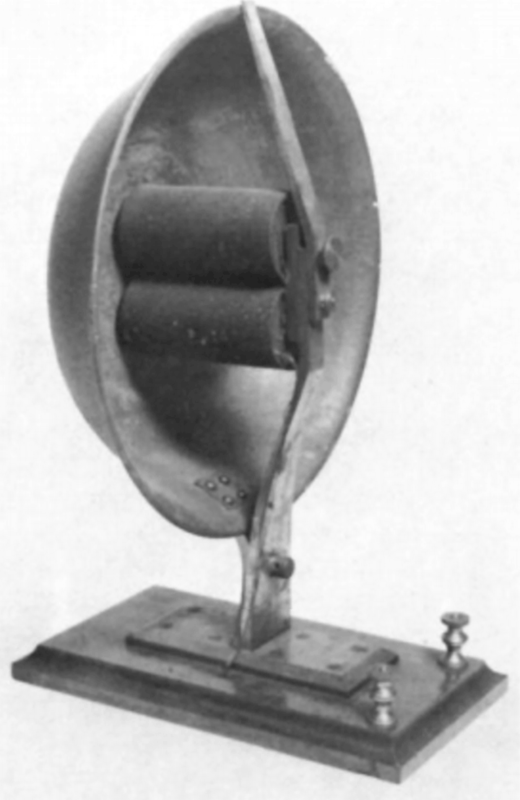 In Paris, Clément Ader created the ‘Théâtrophone’ a type of early binaural or stereo audio transmission of music and theatre in 1881 which ran until it was superseded by radio in 1931 and similarly, in London in 1895, the ‘Electrophone’ service distributed music hall and light music to an audience of subscribers. 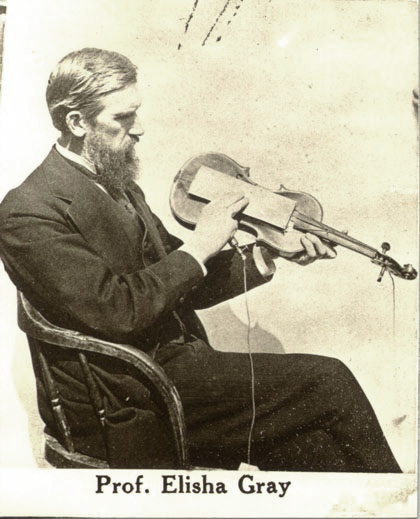 Cahill restructured his patent to accentuate the differences between his invention and that of Elisha Gray – nevertheless, Gray’s ‘Musical Telegraph’ clearly had a major influence on Cahill’s new instrument. Cahill’s major criticisms of Gray’s ‘Musical Telegraph’ was that by using electromagnetically oscillating metal reeds, Gray’s instrument only had enough power to be heard at close range to a telephone receiver and, the Musical Telegraph’s oscillators could only create harsh, simple tones that lacked character and expression. Cahill’s proposal was to generate complex mixtures of sine tones using multiple electrical dynamos that would be powerful enough to be audible to an audience from a distance. A single tone wheel generator with eight alternators. The core of his invention was the tone wheel; essentially a rotor with variably shaped alternators that spun within a magnetic field (The early versions used rheotomes; a set of brushes that contacted the rotor as it spun.) to generate a tone. Each tone wheel was composed of the fundamental tone and six ascending partials. The first model consisted of a mainframe of twelve identical rotors each of the twelve pitch-rotors carried seven fundamental alternators, six third-partial alternators, and five fifth-partial alternators. These rotors were spun at the relevant speed by a belt driven motor, giving the instrument a six octave range. This arrangement gave the Telharmonium two tuning systems; one being a pure harmonic series used for building the timbre of each note, and the other, an equal tempered scale used for combining notes into a scale. The output quality of the tone wheels – especially with the rheotome versions – was harsh and unpleasant. The sound quality was softened by passing the signal through a series of secondary induction coils that filtered the harshness from the sound to a tone approximating a sine wave. (These induction could could also be controlled by the velocity of the keyboard, allowing the musicians a complex level of expressive influence over the tone.). Cahill was able to dispense with these purifying circuits in later models after perfecting rotor teeth cutting techniques to provide an almost pure sinusoidal output. The number of partials for each fundamental could be controlled with familiar organ like stops allowing the instrument to imitate orchestral instruments. In this way, the Telharmonium was the first additive synthesiser; recreating instrumental timbres by adding and mixing harmonics. Dual manual of the MkII Telharmonium. Gunters Magazine 1907. Less familiar was the keyboard arrangement; for the second Telharmonium, Cahill hired the pianist Edwin Hall Pierce to develop a repertoire for the instrument as well as create sounds from the multiple harmonics. Pierce, with Cahill, also defined the unusually complex keyboard arrangement. Because the Telharmonium mechanically created notes using exact divisions that equated to just intonation, Pierce decided to use three sets of keyboards (two or sometimes four in later models) that allowed for thirty six keys per octave (over the three keyboards) – this meant that instead of the usual black and white key layout, the manual consisted of alternate black and white keys and the player had to learn to play over three manuals to achieve an equal tempered scale. Despite this nightmarish keyboard-complexity the Telharmonium had the unique ability – if required – to play over a variety of intonations. A unique clutch like device allowed the player to control expression using key velocity as well as with a foot pedal. The resulting sound was fed through the wire network and streamed to the audience through large, six-foot acoustic horns of various designs– Cahill experimented with numerous horn designs using different thicknesses of wood, metal carbon and paper to acquire the right range of tones. Acoustically resonating speaker of the Telharmonium. 1917 patent. For the Telharmonium to be audible beyond a telephone receiver it needed a much more current than the standard telephone; the output power from the Telharmonium’s alternators was as much as 15,000 watts and around 1 amp at the receiver – compared to a telephone receiver designed for currents as low as six ten-trillionths of an amp. This power did allow the Telharmonium to be audible to an audience but caused interference with the New York telephone network and needed a huge amount of electricity to keep it running. “The first impression the music makes upon the listener is its singular difference from any music ever heard before : in the fullness, roundness, completeness, of its tones. And truly it is different and more perfect: but strangely enough, while it possesses ranges of tones all its own, it can be made to imitate closely other musical instruments: the flute, oboe, bugle, French horn and ‘cello best of all, the piano and violin not as yet so perfectly. Ask the players for fife music and they play Dixie for you with the squealing of the pipes deceptively perfect. Indeed, the performer upon this marvelous machine, as I shall explain later, can “build up” any sort of tone he wishes : he can produce the perfect note of the flute or the imperfect note of the piano — though the present machine is not adapted to the production of all sorts of music, as future and more extensive machines may be. “A skillful performer upon the telharmonium can make it blare like a trumpet, snarl like a bassoon, warble like a flute, or sing like a violin. Four or five performers, playing in concert, will ultimately be able, it is believed, to produce an effect closely approaching that of a full orchestra ; for each bank of keys is furnished with a set of stops somewhat like those of an organ, by means of which it can be made to produce tones almost if not quite identical with those of any family of instruments. At one keyboard one player can play the part of the strings ; at another a second player can reproduce the tones of the oboe family ; at another a third player can reproduce the tones of the brass ; and so on. And each player is able in an instant to modify or transform the quality of tone which he is producing. The, MkI version, as described in his 1897 patent, Cahill built by hand in his laboratory in Washington and, weighing a mere 14,000lbs was essentially a working prototype designed to raise capital for a planned full version . The Cabot St Mill, Hollyoke, Mass as it is today. Once enough interest had been generated to finance the development of the Telharmonium Cahill and his associated moved to the Cabot St Mill in Holyoke, Mass. where construction of the much larger MkII commenced in 1902. the MkII was constructed by a workforce of fifty engineers, grinders, reamers, assemblers and other workers under the guidance of Cahill. The MkII consisted of eight 11” steel shafts bearing a total of 145 alternators. The 60-foot mainframe was built of 18” steel girders set on brick foundations. Ten switchboard panels contained almost 2,000 switches. The whole apparatus weighed 200 tons and cost $200,000 and assumed the proportions and appearance of a power station generator. It was this version that was disassembled in 1906 and transported to by railroad to be installed at the ‘Telharmonic hall’ on 39th Street and Broadway New York City where it was previewed to an audience of nine hundred people. The MkII Telharmonium remained in NYC for another four years giving regular concerts and ‘broadcasts’ at the Telharmonic Hall and other fashionable venues across the city. Despite it’s initial success the subscriber business foundered after the 1907 financial panic and Telharmonic Hall closed in 1910. After the collapse of the ‘Telharmonic Hall’ business, Cahill regained control of the rights to his invention and stoically rebuilt and refined the design to create the final MkIII version back at the Cabot St mill. The Mk III, again weighing 200 tons but with a number of significant improvements including new alternator designs and a standard keyboard for a tempered scale, was installed in the basement of a building on west 56th st NYC. It was here that the Telharmonium made it’s final debut in Feb 1912 streaming music to the Chapter room of Carnegie Hall. Despite Cahill’s improvements and tireless promotion of the instrument, ‘Telharmony’ had lost the novelty value that sustained public interest six years previously and subscribers failed to materialise. Cahill finally filed for bankruptcy in 1914. The MkII and III Telharmoniums were sold for scrap. The remains of the first Telharmonium were kept by Cahill’s brother Arthur but were also scrapped after his death in 1958. THE TELHARMONIUM – AN APPARATUS FOR THE ELECTRICAL GENERATION AND TRANSMISSION OF MUSIC. Dr. Thaddeus Cahill’s system of generating music at a central station in the form of electrical oscillations, and of transmitting these oscillations by means of wires to any desired point, where they are rendered audible by means of an ordinary telephone receiver or a speaking arc, is now embodied in a working plant situated in the heart of New York. Although this apparatus constitutes b.ut a portion of a plant that may ultimately assume very remarkable dimensions, and although it has limitations imposed by its size, the results obtained are so promising, that many applications have been made by prospective subscribers for connection with the central station. When a larger number of · generators and keyboards is installed, as they doubtless will be in due time, there is no reason why the telharmonium, as the invention is called, should not give the subscribers all the pleasures of a full symphony orchestra whenever they wish to enjoy them. At present ‘ very beautiful effects are secured on a . less elaborate scale, but in eveI\ly way comparable with those of a good quintet.. And several additional keyboards now in building at Dr. Cahill’s works at Holyoke, Mass., where the New York plant was built, are nearing completion, and will probably be in service at Broadway and Thirty-ninth Street in the course of another month or two. Perhaps the feature which most astonishes the technically Uninformed man when Dr. Cahill’s invention is first exhibited to him is the fact that music in the ordinary sense of the word, in other words, rhythmic vibrations of the air, is not produced at the central station. The vibrant notes of the flute, mingled with the clarinet or viol-like tones which are heard at the receiving end of the wire, spring from no musical instrument whatever. Nowhere is anything like a telephone transmitter used, although the electrical oscillations which are sent to the receiver and there translated into audible vibrations are quite like those set up in an ordinary telephone circuit, except that they are enormously more powerful. Briefly summed up, Dr. Cahill’s wonderful invention consists in generating electrical oscillations corresponding in period with the acoustic vibrations of the various elemental tones desired, in synthesizing from th ese electrical vibrations the different notes and chords required, and in rendering the sYnthesized electrical vibrations audible by a translating device. In the New York plant the electrical vibrations are produced by 144 alternating dynamos of the inductor type, having frequencies that vary from 40 to 4,000 cycles. These alternators are arranged in eight sections or panels, each inductor being mounted on an ll-inch steel shaft. One inductor dynamo is used for each note of the musical scale, each generator producing as many electrical vibrations per second as there are aerial vibrations in that note of the musical scale for which it stands. The fixed or stator part of each dynamo carries both the field and armature windings ; the rotors are carried on shafts geared together, the number of teeth ( pole pieces) on the gear wheels corresponding with the number of frequencies to be ob-. tained. Because the rotors are geared together, the frequencies are fixed and tuning is unnecessary. The alternators are controlled each by a key in a keyboard upon which the musician plays. Each key serves to make and break the main eircuit from seven alternators, not directly, but through the medium of plunger relay magnets wound with layers of enameled wire. Only feeble and harmless currents are needed to control the relay magnets, by which the task of making and breaking the currents from the main circuits is r’eally performed. No appreciable ‘ time elapses between the depression of a key and the closing of a main alternating circuit, so that the keyboard is as responsive and sensitive as that of a piano. The elemental notes generated by the . 144 dynamos cannot alone be used to produce the most pleasing musical effects. Why this should be so becomes apparent from a consideration of some Simple principles in acoustics. If a wire be stretched between two points A and B (see the accompanying diagram) and plucked or struck, it will vibrate above and below the line A, B and give what is known as a fundamental tone. This fundamental tone is without distinctive musical character or timbre, and would sound the same in all instruments, so that one could not distinguish whether it came from a violin or a piano. In addition to its fundamental vibration between its pOints of attachment, the string undergoes a series of sub-vibrations above and below its own normal curve, which it will pass at certain points, nodes, dividi??? ?g it into equal parts. Thus in the accompanying sketch, A, 0, B and A, D, B represent the fundamental Vibrations, and A, E, 0, F, B, the first sub-vibration intersecting the fundamental vibration at the node 0. Again, the string may vibrate in three parts, four parts, five parts, etc. The effect of the sub-vibrations is added to the effect of the fundamental vibration, and their total effect is heard in the distinctive quality or “tone Color,” as it is called, of the particular instrument played. The sub-vibrations are known as the upper partials or overtones, and generally speaking, they are harmonious with one another and with the fundamental tone. That very elusive and uncertain quality called timbre is dependent entirely upon these overtones. By properly controlling the blending of the overtones and the elemental tones, it ought to be possible to. imitate the characteristic timbre of any musical instrument. This Dr. Cahill has in a large measure succeeded in accomplishing. “Tone mixing,” as this building up of harmonious notes and chords is called, is effected in the telharmonium by superposing the simple or sinusoidal waves of the alternators. By means of bus-bars the oscillations of the ground tones are all brought together in one circuit, those of the first partials in another circuit, those of the second partials in a third circuit, etc. The actual blending is done by passing the various oscillations through a series of transformers. In order to understand how a chord is blended, we must begin at the keyboard. As soon as the performer depresses his keys, the bus-bars electrically superpose the ground tone currents , through the primaries of closed-iron magnetic circuit transformers, the secondaries of which are jained in circuit with impedance rheostats governing the strength of the currents, which rheostats are controlled from the keyboard by means of stops. Similarly the bus-bars superpose the first, second, third, and other desired partials in separate circuits. The composite ground-tone a’nd overtone oscillations thus produced in the secondaries of the transformers are next passed through the primaries of an open-iron magnetic circuit transformer, in the secondary circuit of which a current is produced composed of all the ground tone and overtone frequencies of the particular chord under consideration. This secondary current is in turn passed through the primary of an air-core transformer, and the resultant secondary current is converted by telephone receivers or speaking arcs into the musical chord desired. In order to listen to this musical chord, the telephone receiver is not held to the ear. It would be bad for the ear if it were, when a loud note is sounded. The current of the receiver is literally thousands, and at times millions of times stronger, measured in watts, than those to which an ordinary telephone receiver responds. Whereas less than six tenmillionths of an ampere are sufficient to produce a response from an ordinary telephone receiver, a current of an ampere is sometimes used in the Cahill system for an instant when loud tones are produced. The composition or quality of a note or chord is controlled by eight rheostats called stops. By skillful manipulation of the stop rheostats, it is possible to obtain very accurate imitations of the wood-winds and several other orchestral instruments. Imitation, however, is hardly the right word ; for the notes are built up of exactly the same components as the tones which come from the reaJ instruments. Furthermore, beautiful effects are obtained that cannot be produced on any existing instrument. These stop rheostats control merely the timbre or quality of the music produced. Fluctuations in volume are produced by “expression rheostats.” Both stop and expression rheostats are constituted by impedance coils, differing however in mechanical construction. The stop rheostats are manipulated very much like the stops of an organ, and the expression rheostats like the swell. Unlike an organ swell, however, the expression rheostats are used not only for producing captivating crescendos and diminuendos of individual notes and chords, but also in reproducing the peculiar singing tremolo of the violin and ‘cello. The rather complex system of transformers described serves not merely to blend partials with ground tones, but also to purify the vibrations corresponding with the different sets of partials by purging them of their harsher components. The air core transformers, fur thermore, permit the selection of voltages according to the resistance which the final current will encounter. Inasmuch as each keyboard controls ground-tone and overtone mixing devices, it is possible to produce notes of the same timbre or of different timbres. Excellent orchestral effects can, therefore, be obtained by causing the one keyboard to sound wind instruments, such as oboes, flutes, clarinets, or horns, and the other to sound the tones of the violin or other stringed instruments. From this necessarily cursory consideration of the telharmonium, it is evident that the music is initiated as electrical vibrations, distributed in the form of electricity, and finally converted into aerial vibrations at a thousand different places separated hundreds of miles, it may be. No musical instruments in the sense in which we understand the word are used. Not a string, reed, or pipe is anywhere to be found. The vibrations produced by the performers’ playing are wholly electrical, and not until they reach the telephone receiver can they be heard. The telephone reo ceiver acts for us as a kind of electrical ear to hear oscillations to which our own ears are insensitive. When Mark Twain heard the telharmonium, he fancifully suggested that the military parade’ of the future would be a more beautifully rhythmic procession than our present pageants. The usual military bands heading the various regiments and playing marches, not in unison, although the same in time, will give place to musical arcs disposed along the line of march, all crashing out their stntins in perfect time. The soldiers who will march in that future parade win all hear the blare of invisible electrical trumpets and horns at the same moment; they will all raise their left feet at exactly the same instant, just as if they were but one company. The reason for the failure of Cahill’s project were numerous. The machine itself was impossibly expensive; about $1 million was spent from 1897 to 1914 on the project ( approximately $30 million in today’s value) and it was unlikely that a subscriber business model would have ever covered the costs, let alone make a profit – and, even if Cahill had found enough subscribers, he’d have to have built a power plant to generate enough power. The output power of the Telharmonium caused great disruption of the New York Telephone network, angering telephone subscribers and even interrupting the Stock Exchange, which resulted eventually in AT&T refusing to co-operate in supporting Cahill’s instrument. The Telharmonium was also a victim of an age of rapid technical advances; Lee De Forest began experimenting with radio transmissions as early as 1906 (which included transmissions of the Telharmonium) and by around 1914 wireless radio broadcasts had spelled the end for wire broadcasting. Robert A. Moog,”ElectronicMusic,”Journal of the Audio Engineering Society, October/November 1977, 25:10/11, 856. Dynamo tone generators at Cabot Street Mill. ‘ New Music for an Old World’ McClure’s magazine. v.27 1906 May-Oct.